Location: in the center of Kazanlak city. Accommodation: Grand Hotel Kazanlak has the biggest number of rooms in the Kazanlak city region: 26 single rooms; 118 double rooms, 4 of which with queen-size beds; 3 rooms with three beds and 1 room with four beds; 3 luxury apartments; 1 presidential apartment. All rooms are equipped with telephone, own bathrooms and WC, warm mineral water and local heating system. Some of the rooms have air condition, cable TV and mini bar. In the hotel: Hotel's restaurant has 200 places, lobby-bar, bar "Manhattan" and night bar. 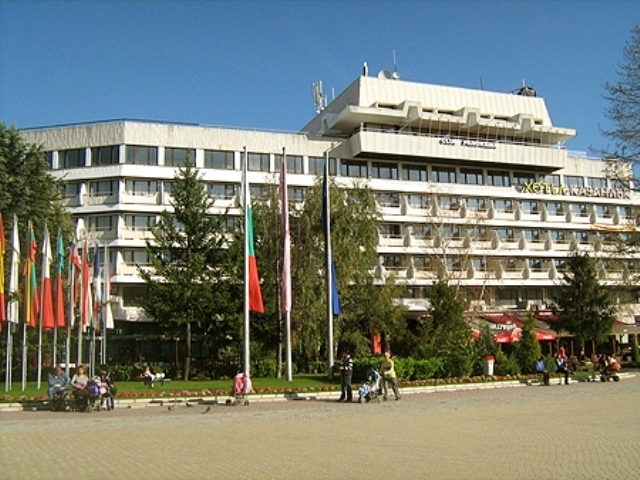 Grand Hotel Kazanlak offers four conference halls - one with 140 places, one with 90 places and two by 35 places each. Halls are equipped with big screens, white boards, projector, TV and video and provide all conditions for successful business work.